Not to interrupt the Curlicue high or anything, but I’ve got something else to talk about – my sample knit for Annie Modesitt’s new book, Men Who Knit (and the dogs who love them). The description of the sample knit makes it seem almost trivial – it’s just a felted dog bed knit out of KnitPicks Sierra. However, Annie’s signature cleverness is present through and through! First, the sides of the dog bed are striped and the reverse stockinette side is the public side. You know that’s going to look super cool all felted up! 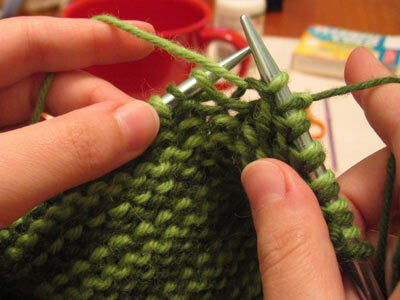 My left hand is purling, and my right, knitting. Believe it or not, in this picture I’m alternating purling and knitting with each of the yarns! Incredible! 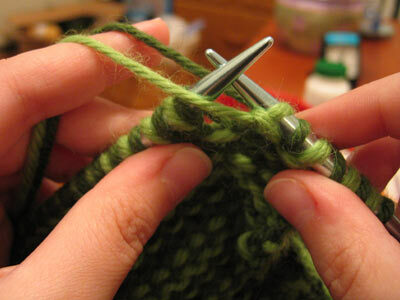 So, you know that double-knitting produces a double-thickness fabric with a “pocket” in the middle. Annie took advantage of this and wrote her pattern in such a way that one side of the pocket is closed, and the other open – that way fiberfill can be stuffed into each pocket before it’s seamed up! So cool! (Also, easy to adjust directions in case the dog owner wants the stripes on the right side). 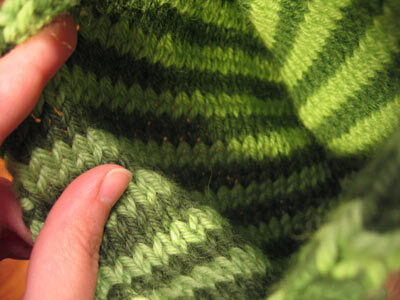 I’m so excited about this project because double-knitting in this way is awesome (and looks mighty impressive), the way the pocket is formed without any extra work is genius (you’ll just have to knit it yourself to find out how! ), and I just love glancing inside it to see all the cool stripes! Oh yeah, ten exclamation points in that entry! Well, now eleven ;). Oh, that thing about my sidebar – I forgot to check browser compatibility. So although my girl Betsy, a fellow Mac user, was able to figure things out, those of you using PC IE… not so much :). Classic mistake on my part. I think it’s better now. The scarf is beautiful and it looks great with the tan blazer! I love the color of the Jaeger Silk. Love the scarf! Definitely on my list of must knits for Christmas…then again maybe just for me rather than a gift. I’m guessing you’re not the mac-n-cheese type, but if you feel the urge again, Annie’s organic M-n-C (in white cheddar) is AWESOME. Nice scarf. Polly hits a home run! Now that I see the yarn, wasn’t that the same stuff Black Olive was blogging about a few entries ago? You are too funny! But seriously, you’ve never indulged in dorm room junk food like Mac-n-cheese or Cheetos? That’s probably how you keep your svelte figure in check. Gorgeous gifts and I do love most all Jaeger yarns (except the cotton ribbon I’m using right now). Wow! Polly did a fantastic job and you look beautiful in lavender. You are not missing anything by not eating Cheez-Wiz. It is the devil’s food. Finally, you better guard that Jaeger, or Paula will want to steal it from you! The scarf with the tan blazer looks really sharp! Are those darts on your blazer? Very flattering outfit overall! You pull it off so well. Your posts are always so amusing and informative. I look forward to your writing every day, so I can’t wait to see what you have up next! Oh what a lovely week you are having! The artificial cheese product “tunic” is a va-voom! sweater, the socks are great, the scarf…. I feel a leetle, no, a lot jealous! The scarf looks great with the tan blazer. It’s a very “now” look. What are you going to do with the two balls of Jaeger 4-ply silk in red? Another scarf? That scarf Polly knit for you is absolutely gorgeous and goes perfectly with the suede blazer. Love the combo! no problems! i’m sure i can speak on kris’s behalf too when i say i am really happy you enjoyed it. Ah, lovely yarn and color–such a nuisance! Sorry, that made me laugh most of all. What wonderful nuances 🙂 Beautiful scarf, looks great with the tan jacket. And great job on the filati! But too many more references to Mac and Cheese and I’m going to have to go out and buy a box. It looks fab! I love the colour, esp with the jacket. I am really liking the scarf…I may have to make that one for mom…or better yet, for myself! I’m so jealous of all the gorgeous knitted things you keep receiving in the mail. I need to get on some knitting pal exchange! Mac and cheese…yeah. When I turned 25, I made up this rule that no longer would I eat Kraft mac and cheese. Alas, the rule didn’t stick, and I still eat it, though my roomate teases me about it every time. am I the only one that’s never had kraft mac and cheese? The first time I ever had any sort mac and cheese was last year and it was Annie’s organic. Oh well, I didnt have a grilled cheese sandwhich till my junior year in college so I must be a late bloomer or something. Scarf + Blazer = Fab! And the pic with the mac is so funny.. hehehe. LOVE the scarf. I really like it in that yarn and think it will be warm and cozy. Not that you need warm and cozy, what with all your hotness. And, LOVE the tan blazer. When I scrolled down to it I thought, wait a minute, that is brown. She hates brown. She’s a liar. But it is actually tan. And tan and lilac look fabulous together. They are complements on the color wheel, you know. Love the scarf — is that the one from the Scarf Style book, or something else? I love knitted leaves, and the ones on this scarf have a beautiful “flow” to them — something I’d definitely love to make for myself (and Mom). What is pattern that was used for your fabulous scarf? Looks great with your blazer!